As like a number of previous Pokemon Games, you will encounter a number of Pokemon during your second journey throughout The Alola Region that you can interact with. By interacting with these given Pokemon during these special in-game events, these Pokemon will attack, thus sending you into battle with them. Most of these Pokemon will be interacted with during given Side Quests. 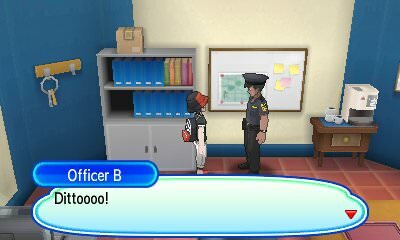 Hypno - Hau'oli City: After defeating your Akala Island Grand Trial, you will interact with Hypno while helping Captain Ilima solve a number of crimes back in Hau'oli City. Each Hypno will have special attributes and moves that were used during said acts of crime. Bewear - Hau'oli City: After defeating your Akala Island Grand Trial, you will interact with Bewear during the Bewear Costume Show in the Hau'oli City Shopping Mall. You will be given a Max Potion for defeating or capturing it. Gastly & Drifloon - Trainer School: While trying to solve the mysteriers back at the Trainer School during nighttimg, you will interact and be attacked by a Gastly and Drifloon on different occasions. You will have to defeat both to complete each given mystery. Ditto - Konikoni City: After completing your Akala Island Grand Trial, you will interact with Ditto in Konikoni City as you help the local police find The Ditto Five, a group of Ditto masquerading as people. Each Ditto will have have unique Individual Value Spreads. Frillish - Route 14: While heading down Route 14, you will interact with Frillish as you try to save the swimmer being attacked by a group of them. Pinsir - Exeggutor Island: While on Exeggutor Island, you will interact with Pinsir that are affecting the local Exeggutor. Electrode - Team Rainbow Rocket Castle: During the RR Episode, you will interact with Electrode that appear to look like Items. This is the only way to obtain Electrode during the game.